Heritage Bee Farm Queens are naturally open mated and arrive ready to begin laying eggs in your colony. Our queen breeder colonies are selected based on a high yield of honey production, brood and a quick spring build-up. Being based in Central Florida our queen grafting cycle starts early which means early mated and queen cell stock availability for nationwide shipping. In addition, we also carefully select queen stock that demonstrates a tolerance to mites and other pests, pathogens and we always looks for a gentle disposition. Our queen and queen cell production aims for stock that is gentle, easy to work with and build ups abundantly for pollination and honey making. If you are a beginner, hobbyist or if you are a seasoned commercial beekeeper, Heritage Bee Farms mated queens or queen cells will be just right for you! Mated queens are marked upon request for $2.00 per queen. Prices above are for pick-up. Additional shipping fees apply if you need them shipped. Reserve your 2019 Queens or Queen Cells in 3 EASY ways! After taking your queen order we will email you an invoice that will allow you to make payment via credit card. Click on the link in the invoice to view details and make your payment with your preferred credit card. All pre-orders for the upcoming spring season will be due in January of the new year. Please Note: Your Queens or Queen Cells are not reserved until full payment is made. This is especially important in the spring when demand is high. WE HAVE QUEEN CELLS AVAILABLE FROM FEBRUARY TO OCTOBER and can be picked up at our Myakka City Florida location or we can ship them out safely using UPS overnight shipping. Italian Queens and Queen Cells are known for producing hives that have a high volume of brood year-round. The queen tends to continue to lay eggs regardless of weather, nectar or pollen conditions and many beekeepers who pollinate in early spring prefer the Italian for this reason. Since Italian queens produce a large hive population, it’s important keep the colony fed throughout colder months when bees are unable to forage and are also otherwise consuming high amounts of syrup or honey. They can sustain in the colder climates but will need food or honey for the brood. Heritage Bee Farm Italian Queens and Queen Cells have mixed coloring since we allow for healthy open mating. They have many fine qualities: the queens are exceptionally prolific, known for a fast a spring buildup, and they gentle. From New Beekeepers to Commercial Pollinators and Honey Producers you can be confident that when you purchase an Italian Queen or a Queen Cell from Heritage Bee Farm you are not only getting a high quality Queen with great genetics, but you are getting the benefits of a high quality control process: from breeder queen selection, to colony feeding (to produce quality royal jelly and queen cells), to grafting, incubating and finally getting the queens and cells to you... through shipping or delivery. We do all we can to ensure quality and care each step of the process! Carniolan Queens are an excellent choice in colder or mild climates since during the winter and colder months the colony will have a smaller cluster of bees due to the queen slowing down her egg production. As a result of the smaller hive population, there will be less brood and the hive will need less food to sustain them over the course of winter. Spring buildup will be comparable, to slightly slower, than Italians and once the hive has a larger population they are should also be equally productive as the Italian Queens. Another good trait in the Carniolan Queens is that they are great at pollen collection and very gentle. Whether you’re buying a Mated Queen or a Queen Cell from Heritage Bee Farm you can be confident that we have spent the time to ensure good genetics by allowing for open mating. This often results in a mixed breed of quality traits between our Italian Queens and Carniolan Queens as well as the associated benefits often sought after in quality queens. Many beekeepers who are not in one extreme climate or the other, will usually try both breeds in order to have continue strong diversity and quality traits. 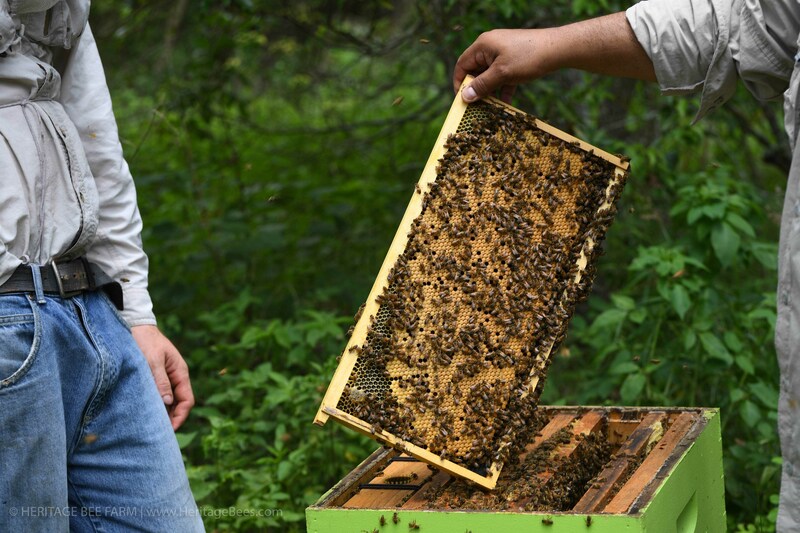 Heritage Bee Farm home base is in Myakka City, Florida and has mated and queen cell production beginning in early February through October of each year (depending on weather factors). Our Italian queens and Carniolan queens are shipped weekly via USPS Overnight Express and UPS Next Day Air. The cost to ship under 30 Queens usually runs $25.00. When you buy queen bees from Heritage Bee Farm, you will receive the USPS or UPS tracking information and updates on your order, from the time your queens are shipped until the moment they arrive. Whatever your goals are – From Honey production to Pollination; it’s our honor to sell the finest quality Mated and Queen Cells available! Mated Queens, Virgin Queens and Queen cells are always in limited quantities based on the season. Please pre-order yours early so we can be sure to reserve your needs as soon as possible.